Thirst Class Ale is a microbrewery based in Stockport founded by Richard Conway. Richard began homebrewing in 2012 and, after doing well in homebrew competitions both locally and nationally, decided to take the plunge and “go commercial” in 2014. Starting out as a part time 2-barrel venture in a small unit in the centre of Stockport, things took off, and in 2016 Richard left his day job and upgraded to a 10-barrel operation in a much larger unit. 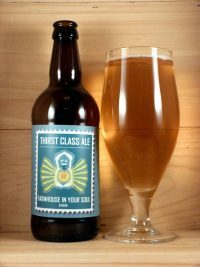 Thirst Class Ale has a loose core range of beers but mainly focuses on brewing experimental beers across a range of styles from American IPAs through to fruited saisons, Imperial stouts and barley wines. Brewed with a nod towards a traditional saison but with a little extra hop character, Farmhouse in Your Soul begins with a fairly classic malt bill made up of Pilsner and Vienna malt with some added wheat malt for extra head retention and a fuller mouthfeel. On the hop front, Northern Brewer brings a firm but neutral bitterness and, along with Willamette, adds an earthy flavour to the beer. Saaz complements these flavours and brings an added spiciness. The main flavour characteristics however come from the Belle Saison yeast, which gives a great balance of traditional saison flavours. Belle Saison is hungry and even with a fairly high mash temperature can finish as low as 1002 – it also works well at higher fermentation temperatures with no adverse flavours – so no need for any temperature control, just let it do its thing!